Fr. Adelir Antonio de Carli launches on his quest to set a new record. It ended badly. People in Paranagua, Parana, Brazil, watched as a Roman Catholic Priest ascended toward heaven. No, really: Fr. Adelir Antonio de Carli filled 1,000 balloons with helium and, dressed in a helmet, thermal suit and a parachute, and carrying a GPS receiver and a satellite phone, headed skyward in an attempt to break the 19-hour record for staying aloft with party balloons. He was declared missing eight hours later when he failed to check in by phone, and was judged to be off course — and 30 miles out to sea. 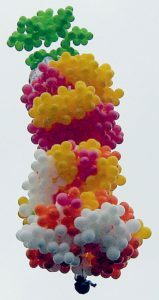 A search found some of the balloons, but there has been no sign of the 41-year-old flying priest. “We are absolutely confident he will be found alive and well, floating somewhere in the ocean,” said a spokeswoman for his parish. But the London Telegraph newspaper reported that “hopes are fading” for the priest. “The priest’s death would make him an immediate contender for the annual Darwin Award,” the paper said, “named honour of Charles Darwin, the father of evolution, and ‘commemorate those who improve our gene pool by removing themselves from it. '” (AP, London Telegraph) …A hell of a thing to say about a guy who pledged celibacy. Larry Walters as he takes flight in 1982. Does this story remind you of something? That would probably be Larry Walters. I used to get “submissions” of his story all the time — everyone who got it by email thought it happened “yesterday,” but indeed it didn’t. The man who went flying in his lawn chair over Los Angeles is real — and I remember when it happened. Yesterday? Heck no: it was July 2, 1982. Of course, the story keeps going around on the Internet like it was recent — and most of the versions are highly …well… inflated with ridiculous, false details. He did not, for instance, take a six-pack (or case) of beer on his flight, but rather a bottle of soda pop — as well as a portable CB radio, a parachute, and a pellet gun. 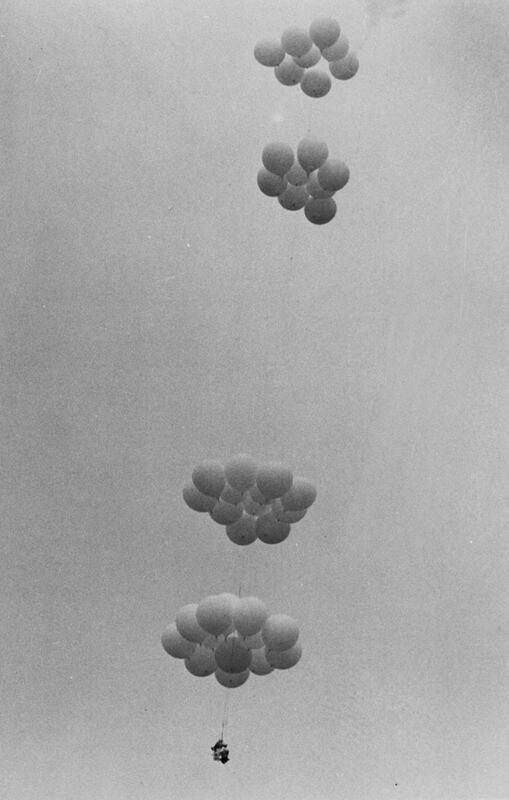 His launch of “Inspiration I” — an aluminum patio chair with 42 helium-filled weather balloons attached — was assisted by two friends, one of whom presumably snapped this photo. His resulting 16,000-foot altitude was confirmed by two airline pilots, who reported him to the FAA (the agency fined him $1,500). Most versions of the story say he was “rescued” after he drifted out to sea by a helicopter — a detail which is pretty dang unlikely, when you think about it. (And you did think about it before buying into the full urban legend, right? Right?!) In real life, the ending was amazing enough without embellishment: he shot out a few of his balloons with the pellet gun and landed softly — though the balloons draped over a power line in Long Beach, blacking out the neighborhood for 20 minutes. Amazingly, he wasn’t killed. Yes, he walked away: Walters after landing, carrying his now-famous lawn chair. But Walters committed suicide on October 6, 1993, by shooting himself in the heart — he was unable to cope with the all-too-brief interest in his story. He was 44. Of course, others have followed in Larry’s …uh… airy footsteps and pulled similar stunts. But Larry is the most famous — for a while, there was was even a movie about him in development. We’ll see if the priest beats him on the fame front. Nearly three months later, a portion of a body was found floating in the water. DNA tests confirmed the body was the priest’s. …a guy who pledged celibacy. I mean no disrespect to the (very likely) recently deceased, but as a former seminarian, I feel entitled to laugh at your tag line. If there is a gene for holiness, my church has been selectively breeding it out of our species for centuries. Does anyone have the story of the guy who holds the 19 hour record? And there was Ken Couch in Oregon last year. in time, the priest has a GPS, but do not know how to use the GPS. Ask the police officers by fone (in flight) instructions to use the GPS but was ineffective. A week ago, he has broke a Guiness Record for Highest Flying in party balloons. All this was broadcast in TV. No mention of a 19 hour record anywhere. This appears to be a factoid, although it is mentioned in every single report of the story that I have seen. That in itself is an additional curiosity. The duration record for gas balloons designed for flight is much longer than 19 hours. The reason every story I saw included 19 hours is because I included that in my Google search criteria. Apologies for that oversight. Gives new meaning to Q.E.D. Nevertheless, there are over ten thousand returns. In the first twenty or so, the majority reference the supposed record to be for helium (not party) balloons, compounding the error. The story is already rich with levels of humor (celibacy/death/Darwin/removal from the gene pool). I originally wrote with the intent to add another level, the nature of the record to be broken. If it turns out to be undocumented (looking that way), all the more stranger than fiction. Kudos to rc for acknowledging the unresearched record; it was not my intent to question his work. Same goes for my unintentional google sleight of hand. I live in southern Brazil where the priest made that trip. Leaving on 20 April, his remains were found on 3 July, off the coast of Rio de Janeiro. I think he floated most of the way. So, he did indeed win the Darwin award – in a way, being a priest should automatically make the person a contender, but it certainly doesn’t guarantee that they will leave no offspring. But, being a priest and doing something really stupid – well, he certainly removed himself from the gene pool. 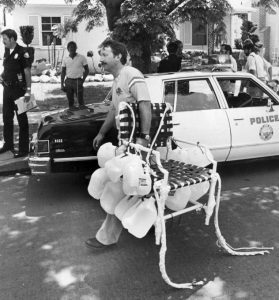 Odd that nobody mentioned that the lawn chair balloon ride was reproduced in part on MythBusters. A segment can be seen here. What about the Australian movie “Danny Deckchair”? Haven’t seen that comedy, but it was inspired by Lawnchair Larry.